The Promax Bar is the best tasting energy bar around - and it is loaded with performance nutrition. 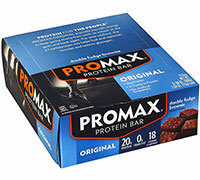 Promax makes the best tasting nutrition bars on the planet. And to help you perform at your very best, they packed Promax bars with energy-sustaining carbohydrates, essential vitamins, minerals and amino acids. And they added a full 20 grams of high-quality protein! INGREDIENTS: Protein blend (whey protein concentrate, calcium caseinate, hydrolyzed whey protein concentrate), corn syrup, high fructose corn syrup, soy protein isolate, chocolate flavour coating (sugar, fractionated palm kernel oil, cocoa, whey, nonfat dry milk, soy lecithin and natural flavour), processed cocoa, coconut oil, wheat flour, peanut butter and natural flavour. Manufactured in a plant that processes peanut, nut meats, soy, milk, and egg products.